A vehicle has plowed into people marching in downtown Charlottesville. Earlier, Virginia declared a local emergency when clashes broke out between white nationalists and counter protests over the removal of a monument. Authorities are on the scene after a vehicle plowed into a group of people marching peacefully through downtown Charlottesville, in the US state of Virginia. Several hundred protesters had gathered to march when the car drove into a group of them. 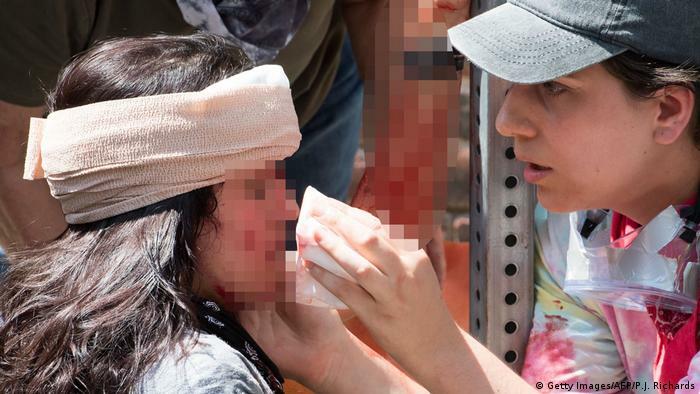 The American Civil Liberties Union (ACLU) tweeted images from its local chapter showing people with what appeared to be minor wounds. Virginia Governor Terry McAuliffe posted on his Twitter account Saturday morning local time that a local state of emergency was officially declared in order “to aid state response to violence” at the Charlottesville rally. Meanwhile, US President Donald Trump tweeted that Americans should be “united” and not allow violence to drive divisions. As many as 6,000 white supremacists, including supporters of the Ku Klux Klan (KKK), are expected to descend on the normally sleeping university town of Charlottesville for a second day to protest the removal of a statue of Confederate General Robert E. Lee from a public park. Charlottesville is situated about 160 kilometers (100 miles) outside of the US capital, Washington, DC. White supremacists and members of the KKK oppose the removal of a statue of Confederate General Robert Lee. They claim it is a benign symbol of southern heritage, but critics call it an overtly racist symbol of slavery. McAuliffe said he had given security forces instructions to act quickly and decisively if violence breaks out. 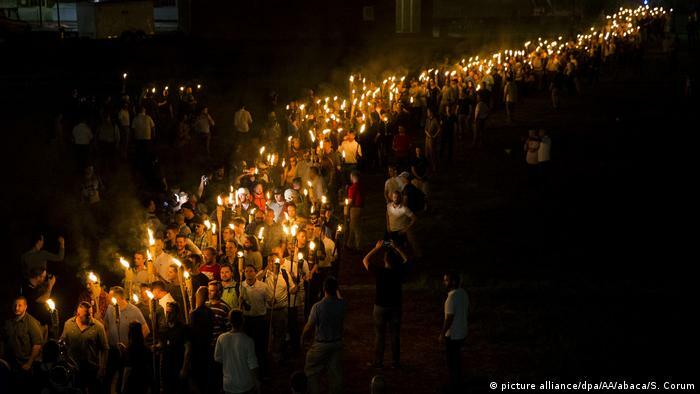 Hundreds of white nationalists marched Friday night on the Charlottesville campus of the University of Virginia. In a display of overt racism the marchers carried burning torches. Burning torches are a medieval symbol of intimidation and were a prominent feature of KKK rallies in the 20th century. But unlike those rallies, where the Klansmen hid their identities behind white masks, Friday’s protesters had no qualms about revealing themselves in public. The KKK officially endorsed Donald Trump’s presidential candidacy, and they have been emboldened by his administration’s fierce crackdown on immigrants. General Lee led the Confederate South in its bid to secede from the United States in order to, among other things, maintain slavery. Lee, and other people related to the lost civil war, remain widely popular across much of the south, as evidenced by statues and roads commemorating their war-time leaders. The Confederate flag is another potent symbol. In addition to plans to remove the statue, officials have named Lee Park, where the statue stands, to Emancipation Park. Mimi Arbeit, an organizer of the counter protests, rejected Kessler’s claim that the rally was about freedom of speech. 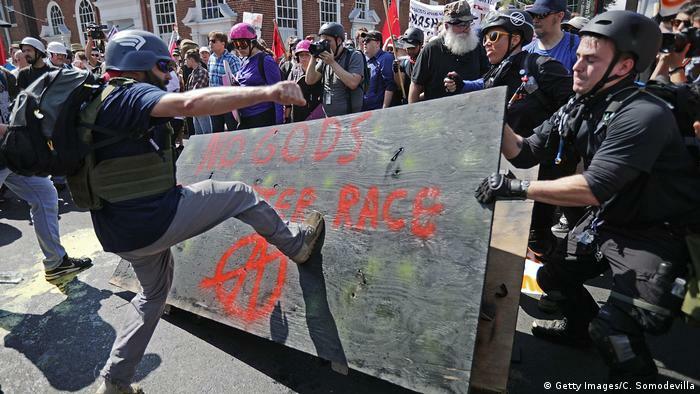 Several bouts of violence broke out at a white supremacist rally in Virginia Saturday as demonstrators clashed with counter-protesters in the streets surrounding the park where the rally was held. Video of the incidents showed armor-clad, shield-carrying demonstrators trading punches with similarly armed counter-protesters as they marched in the city of Charlottesville. TRUMP: Lawyer raid is an attack on America??? Yo me quedo con la chillona. La otra es bonita pero taaaan monotona e igual a tantas otras… seguro que dentro de media hora no serÃ© capaz de recordar la portada Turca y sin embargo la otra sÃ­. Eso sÃ­, lo cierto es que la portada parece mÃ¡s propia de la Rolling Stone que de Vogue.